The excitement at Mesdag Basecamp, where I had the immense good fortune of staying with Tiffany, Sara and Candace in Ashford, was palatable that morning. We'd unpacked, analyzed, giggled and repacked practically all night. We were ready. Guide Melissa broke the day into hour long segments with a short break for food and sunscreen reapplication at the end of each. Our goal was to get up there having conserved as much energy as possible for the summit bid. Heading to Camp Muir, 8/20,10. At a pace that allowed us to gain 1,000' per hour, give or take, it took us just shy of six hours. The pace was very comfortable, not quite easy, but comfortable. At each break, we'd fuel up, drink water, find as much privacy as possible in the giant snowfield to do our "business," and move on. I'll never be shy about peeing in the woods again, that's for sure! Camp Muir came into view after our last break, and it was as perfect as I expected. The camp consisted of several Himalayan-esque huts perched on a rocky ridge surrounded by snow. Prayer flags tied to the NPS Ranger Station fluttered in the wind. Us girls opted to give another RMI climb ascending at the same time* the RMI hut while we split into three Mountain Hardwear expedition tents for a "true alpine experience" devoid of snoring. Tiffany, Sara and I took turns sorting summit day gear in our tent, devouring freeze dried meals, and sharing our excitement with our teammates. NPS Ranger Station at Camp Muir. We finally turned in for the "night" around 7pm for our "nap." I fell in and out of sleep, discovering the 20º bag I'd brought wasn't quite warm enough. The forecast called for 5-10º at the summit with 30-40mph winds, and a slightly warmer 20-25º at Camp Muir. But it looked like a perfect day to climb a mountain. Melissa came by with a cheerful, "Good Morning, Ladies!" just after midnight. I was relieved to be getting up; the non-sleep and excitement were making me nuts! She'd given us rope team assignments the night before, and I was looking forward to climbing with Solveig and Tiffany. We left Camp Muir just after 1:30am. My favorite part of the nighttime climbing was watching all of the tiny headlamp lights winding their way up the route ahead of us. The first leg took just over an hour, winding across the Cowlitz Glacier to Cathedral Gap, then on to the Igraham Flats. The ascent was minimal and gave us a great chance to warm up. Melissa warned us to keep our ears open for the sounds of rock and ice fall, which we'd heard a few times during the night. It's enough to make sure you're acutely aware of your surroundings, that's for sure. The second leg, which took us across the Ingraham Flats, to the base of the Disappointment Cleaver, then to the top of it, would be the longest and the most challenging. The hour and a half took us up a section of mixed climbing - hand over hand crawling and high stepping up boulders, scree slopes, snow, and everything in between, all with crampons on in the dark. It was all I could do to keep my heart from jumping out of my chest. At this point, I realized what a big deal this climb really was; Solveig and Melissa told us to stay on our feet with good reason. Part of me was grateful the night shrouded the route. Break time in the summit crater! By the time we reached the top of the Cleaver at 12,300', I was both physically and emotionally ready for a break. But to spend an hour and a half being so scared and persevering was the best feeling in the world. I felt exhilarated and re-energized. As the guides worked with us to assess ourselves, I realized for the first time that I was going to make it. On the next section, we had mostly steep snow to deal with, and the sun began to rise. I could see each separate layer of clouds in the distance and lightening over Mt. Hood miles and miles away. My focus remained on the trail, the rope in front of me, and my breathing. Glances at the great deep blue crevasses in the Emmons Glacier running parallel to our trail sent bursts of adrenaline from head to toe. Our last break before the summit was short. The wind had picked up and I could see clouds blowing past the summit above us. Our guides made sure we focused every inch of our being on climbing, and I could see a small rock band above us - the crater rim. Before we could reach it, we crossed a small aluminum ladder spread across a crevasse with a hand line. We continued up, and before I knew it, we'd climbed to the rock band, over it, and began dropping down into the crater. We picked a flat spot, dropped our packs, and I sat down, letting a few tears out, and wondered in happy disbelief how I'd managed to get there. By the time we were ready to descend, the wind had picked up and gray clouds had started forming above us. Melissa discussed again the importance of descending "in good style," and how the climb was only half over. It took us six hours to ascend from Camp Muir and three hours to get back. (I blame that stretch of the climb for the soreness in my quads the next day!) After an hour at Camp Muir and a migraine pill, we descended the rest of the way to Paradise. I learned I'm not as adept at boot-skiing as I thought, and glissading is more fun if you've got waterproof pants on. But by 3:30pm, we were safe at Paradise, and on our way down to RMI Basecamp for celebrations. Our team of mountaineeresses! 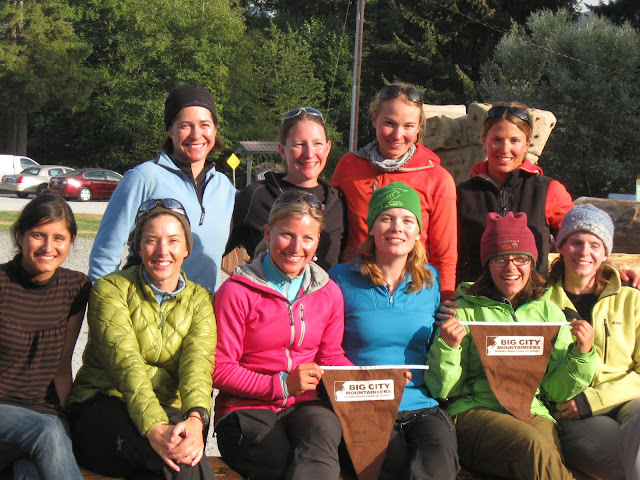 From left, standing: Alicia, Hillary, guide Carrie, guide Melissa, Kruti, Amy, guide Solveig, Sara, Tiffany, Me. Photo courtesy of Tiffany Royal. You don't conquer mountains. You respect them, learn as best you can how to climb them safely, and sometimes, you're lucky enough to reach the summit and return home in one piece a changed person. I am a changed person because of this experience. The physical challenge of climbing the mountain, the mental battles each of us fought, the way we worked together as a team, and the cause we worked toward have given me a renewed sense of what we're all capable of if we care enough. And I can't wait for the next adventure! *As it turns out, some members of this co-ed climb led by Gabi were ascending Mount Rainier on behalf of the Seven Ribbons Foundation. 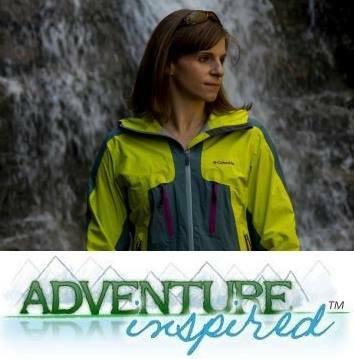 Congratulations, and good luck to them with their Seven Summits endeavor! Great report! Congrats again on your adventure! Somewhat wished I did the womens climb - we definitely needed more girl power in our group! (there were only 3 of the 6 guides and 17 climbers) Your last paragraph summed up the experience perfectly. I would love to quote it, in fact, for my upcoming thank-you presentation for all that supported and donated at my work. (credit noted, of course). Congrats to you and your team! Ania - I'd be glad to let you use my last paragraph in your presentation! I'm so glad you were able to summit as well. And I definitely consider myself incredibly lucky to have been a part of the women's team. I'll check out your blog as well. Thanks!